The Proper Pit Bull is an all-volunteer/foster based organization dedicated to education, advocacy, outreach, and rescue. Our Mission is to promote proper pit bull ownership and responsible rescue through community partnerships, education, and positive training. Our Founding Members bring years of experience to the organization, sharing their valuable skills in rescue, training, and volunteering which is the foundation of our cause. Through their efforts, a solid organization has been created worthy of the pit bulls we aid. We believe the only way an organization will survive and thrive is through building strong relationships; therefore, the majority of work we do is through outreach and partnerships with attuned organizations willing to assist in our own backyard. We are dedicated to helping pit bulls because we believe in keeping them out of the shelter system and in proper homes, because local dogs should meet their full potential as companions through positive training and proper ownership, because it is a privilege to make a difference in the life of even one dog and because it is the perfect way to honor the pit bulls that have touched our own lives. Everyone has that one pit bull that started it all for them and sent them on a journey to make the world a better place for these wonderful dogs. For Nicole, that pit bull was Nissa, and later Neville. For over a decade, Nicole has been very active in advocacy and rescue. She has used her skill set as an event planner and her knack for networking and development to fundraise for a local rescue and through that rescue gained an extensive knowledge of pit bulls and dog training, for which she is forever grateful. Nicole has been an obedience instructor for the past 9 years and currently teaches the Bully Breed class at a local shelter. Nicole has also had the honor and privilege to assist and volunteer with three dogfighting confiscations. Because of a never ending desire to help pit bulls, Nicole decided to bring together a group of like-minded, passionate individuals and start The Proper Pit Bull. Confident of her team and their passion and drive, Nicole is certain that TPPB can assist in making our own backyard, and the world, a better place for pit bulls by becoming a viable resource for pit bull owners and advocates everywhere. Nicole currently shares her home and love with her three pit bulls, Nash, Nala and Noelle and their three cats, Riley, Royce and Rogue. Jen has been actively involved with pit bull rescue and advocacy for several years. 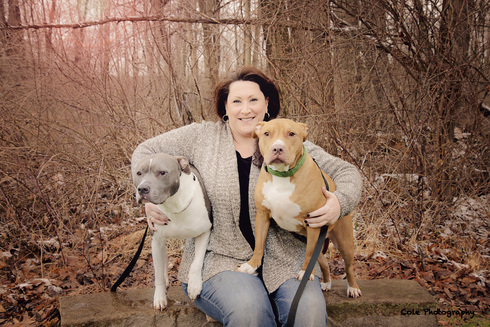 Her love of pit bulls began over a decade ago while working as a veterinary technician. After meeting just about every breed of dog imaginable, it was the pit bull that stole her heart. In September 2002, Jen adopted her first pit bull and began to understand how unfairly these dogs were judged which ultimately led to her interest in rescue. In addition to advocating for pit bulls locally, Jen has also assisted with the care of dogs rescued from large scale dogfighting busts. She has a special love for seniors and simply cannot resist a pit bull with a gray muzzle and special needs. Toni wanted to be a voice of reason and an advocate with facts not just emotion. She wanted to ensure that when she spoke of and about these dogs that she didn't come across as that "crazy dog lady" but someone that has had experience with them and could defend the common myths that we hear, someone that made people think differently about the dogs she had come to love. She did everything she could to educate herself both from an advocate perspective and also trying to understand the other end of the spectrum and what leads people to fear these dogs and ban them. Through everything, it brought her to The Proper Pit Bull group and she hasn't looked back. She is so thankful that she finally found a group that helps to address the core issues we see in the community. She has joined a group of like minded people that support one another and do everything they can, together as a team to make a difference in the lives of these dogs. It is always about the dogs first and foremost. She is a firm believer that rescue and advocacy is not a race. It's not about outdoing some other group but instead working together to make this world a better place for these sweet dogs... for all animals. ​Toni also believes in continuos education and socializing with her dogs. Even though her dog Waylon has passed his CGC and has obtained his Therapy Dog certification, as a team they continue to participate in obedience and rally classes. She feels this is an important step in the bond that they share but also a great opportunity to keep him engaged and active in society and to also show off some of his skills and tricks. Jess has been an animal lover all her life. Growing up with cats, reptiles, and fish, it wasn't until 2015 that she brought home her first dog. After establishing her career as a Graphic Designer, she decided it was time to have the loyal companion of a dog. Without knowing much about pit bulls or dogs in general, Jess decided to take a visit to the shelter where she met Odin. Odin was so friendly and loving that she took him home the next day without a doubt in mind that he was going to be perfect for her. Sure enough it was the perfect match, however, she quickly realized how much breed discrimination was going to play into her life and wanted to do something about it. After her first dog class, she learned about "The Proper Pit Bull" and felt it would be a great way to advocate for the breed. Odin is now a poster pit and enjoys going to events with mom showing everyone how gentle and loving a pit bull can be. Jess and Odin are also a Therapet team at Animal Friends. Jess decided that her and Odin were ready for another dog in 2018 and adopted Calvin (now Hector) from The Proper Pit Bull. Both dogs have brought so much joy and love into Jess's life. She is looking forward to the years to come as a volunteer and advocate in the pit bull and dog rescue community. Vanessa attributes her love of animals to her father and her love of rescue to her first dog, Sasha. Sasha is a pit bull mix that Vanessa adopted from Animal Friends in January of 2010. By the end of the same year, Vanessa would find herself volunteering at that very shelter. She has been involved in rescue in various capacities since then, even joining several of her rescue friends out of state assisting in dog fighting confiscation efforts. While pursuing her Masters of Public Health Vanessa had the opportunity to intern at the Humane Society of the United States in their state legislative affairs department. This led to her graduate thesis, "Breed Specific Legislation: Does policy equal prevention?" being presented at the Annual Public Health Association Conference in 2015. She currently lives with her three rescue pit bull mixes: Sasha, Keisel, and Henry. Danielle has been immersed in animal rescue since 2008 when she rescued her first dog – an American Pit Bull Terrier. Since then, she has played a volunteer role in dogfighting confiscations, training, kennel enrichment and advocacy. Danielle believes that it's important to help those who cannot help themselves, and to be a voice for those who cannot speak. She is proud to be that voice with The Proper Pit Bull. Michelle was first introduced to pit bulls in August 2005 when she was rescued by her now 12 1/2 year old pit mix, Diamond. Diamond had a rough start to life; an owner that didn't want her and a handful of medical conditions that needed immediate treatment. With her zest for life, she never gave up! Diamond taught Michelle how to love unconditionally and showed her a life she never imagined. In 2009, Michelle, her husband, Mark, and Diamond opened their home to Kolby (now Theo) who was part of the largest dog fighting bust in history. It was that experience that opened her eyes to a new world and the true meaning of "we do it for the dogs". The following year Michelle and Mark assisted with a dog fighting confiscation which played an integral part in their continuing journey in rescue. In 2012 Michelle and Mark spent every Saturday with the dogs from a local dogfighting bust ensuring they got a long kennel break, treats and lots of love. Jennifer’s first rescue dog was a retired racing greyhound. It was through transitioning him from a dog that only knew the track, to a family pet, that she found her love for rescue and shelter dogs. Jennifer has been involved in rescue since 2010. She shares her home with a pit bull mix named Mia and a cat named Sardu. Tena is the owner of Success Just Clicks Dog Training. When she was 7 years old her aunt, who was a vet at the humane society at the time, took her on a behind the scenes tour of the shelter and that started a lifelong interest in rescue and sheltering (not coincidentally, that following year she adopted her very first pet from that shelter a kitten named Meeko). She grew up with family bulldogs and always enjoyed "training" them but really picked up training as a more serious hobby with the first mixed breed puppy she actually raised as a young teen and the rest is history. Although she doesn't share her home with any pit bull type dogs, she enjoys working with them and advocating for them. She shares her life with 2 polydactyl cats and her 3 herding dog mixes, Shayne, Rio, and Oswin, who all actively compete in a variety of dog sports (agility and rally obedience are our main sports but we dabble in others). Her dog Rio is also a registered therapy dog and crisis response dog and really enjoys that work! Sherrianne is an Assistant Professor in the Biology Department at Indiana University of Pennsylvania, as well as an Adjunct Professor at Westmoreland County Community College. Throughout her career she has worked with both domestic and wild animals. As an undergraduate at IUP she did an internship at Turpentine Creek Wildlife Refuge in Arkansas, a facility that focuses on rescuing abandoned, abused, and neglected big cats. Within her local community, she is a first responder with the Westmoreland County Animal Response Team, as part of their Small Animal, Large Animal, and Exotic Animal Teams. She became interested in dog training and behavior when she rescued her pit bull Gracie in 2011. This new found love of pit bulls led her to volunteer for a local pit bull rescue along with Gracie. She is currently an Assistant Trainer at a local shelter. Jenny committed herself to pit bull rescue and advocacy after adopting her first dog, Kova, in July of 2016. Jenny had been aware of the stigma against bully breeds and had herself been uncertain about the truth behind these amazing creatures, that is until the day she fell in love with her special girl. Jenny has long been an avid animal lover, growing up with several dogs, cats, birds, reptiles, and everything in between since her childhood. Her mother taught her the importance of respecting animals and loving them as your own from an early age, and it has followed her throughout her life. She became involved in The Proper Pit Bull in 2017 as a way to give back after receiving a Scholar Pit scholarship for her girl, and found herself managing the program within a year. Jenny is an active volunteer, assisting with tabling, enrichment, training classes, and events & fundraising. She is proud to be an advocate for the breed and continues to dedicate her time to breaking the stigma for others.